It with much sadness that we announce that violinist Jamie Campbell – a cherished member of the New Paths team since inception – has been seriously ill and is unable to play in the festival next week. Jamie has been suffering from pneumonia and will be resting for another week or so. We wish Jamie a speedy recovery to good health. The four other violinists already on the team have agreed to take-on the pieces which Jamie would’ve played, as set out below. We are deeply grateful to these wonderful musicians for saving the day. 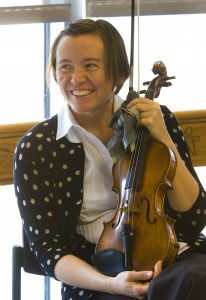 American violinist Cecily Ward (who for 20 years was first violinist of the renowned Cypress String Quartet) – pictured above – will join us on Sunday for the closing concert of the festival. We’re delighted that Cecily is able to step-in. We are proud to have such a committed and flexible group of musicians.